Addressing speeding and cut-through traffic on local residential streets. View the Traffic Calming web form. If you would prefer to submit your application in writing, please contact the Traffic Engineering Division for a blank form. 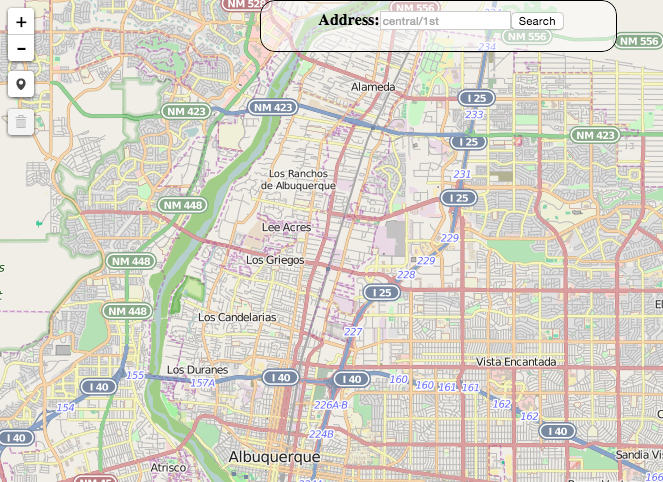 View a map of Albuquerque's current traffic calming requests. What is the Neighborhood Traffic Management Program? This website provides information about the City of Albuquerque's Neighborhood Traffic Management Program (NTMP). The goal of this program is to address speeding and cut-through traffic on local residential streets using a set of traffic-calming tools. These include physical tools, such as lane narrowing, turn restrictions, and curb bulbouts, as well as non-physical tools like radar speed signs and targeted enforcement. This website also houses the NTMP Policy Manual, adopted by the City Council in February 2015. This manual outlines the process by which neighborhoods may request traffic calming, establishes the criteria for determining applicability and appropriate measures, and the toolkit of traffic calming strategies. Download the entire NTMP Policy Manual. Any roadway that is greater than a collector roadway will be automatically denied by the online application system for traffic calming. Classifications of roadways are determined by the COA’s planning department and MRCOG. The application for traffic calming must be completed by a total of 3 residents that are affected by the roadway segment. Information must be provided to ensure neighborhood is in agreeance for new traffic calming measure. One other form of application that will be accepted is by a neighborhood association president or board member representing HOA or NA. A petition shall be sent to the designated neighborhood contact. They must have the petition completed and signed by at least two-thirds of the affected households for that street segment being considered. Affected household will be determined by the COA. Note: The application will then be considered only upon completion of these steps. This will give councilors an idea of the streets that need traffic calming attention. For requests made, you may check back within 4-6 weeks for status of application. Residential street sections with at least 50 percent of the houses facing the street for traffic calming. Residential street sections with two or more preventable accidents within 3 years. This would be followed by residential street sections with one or more preventable accidents within 3 years. Residential street sections with 1000 or more vehicles per day for traffic calming. This will require a traffic count which is less expensive than a full study. This would be followed by residential street sections with 750 vehicles per day for traffic calming. This would be followed by residential street sections with 500 vehicles per day. Collector street sections with 1000 or more vehicles per day for traffic calming. This would be followed by collector street sections with 750 vehicles per day for traffic calming. This would be followed by collector street sections with 500 vehicles per day for traffic calming. Once funding is identified, the Traffic Engineering Division will hold a scoping meeting with applicants and other stakeholders to assess the traffic problem. Traffic Engineering Division provides report detailing problem and recommended solutions from NTMP Toolkit. Applicant distributes copies of the report (or instructions on how to obtain it on City website) to households in petition area. Traffic Engineering Division takes feedback and makes adjustments as necessary, determines priority of project in relationship to other requests, identifies funding or potential sources of funding for implementation.